‘Protected areas’ or ‘parks’ are catch-all phrases for areas of land or sea that are being protected in the name of conservation. Over 13% of the land on our planet is in a protected area. That is a vast two billion hectares – over twice the area of the USA. There are different implications for the people living in a protected area depending on its type. Some parks are ‘strictly protected’, meaning people are largely banned. Other parks incorporate the ‘sustainable use’ of resources in the ethos of how the area is managed. For tribal peoples, the impacts of strict reserves can be severe. They can be illegally evicted from their ancestral homelands and banned from accessing its resources. Sustainable use areas, on the other hand, can help tribal communities to protect their lands and resources from external pressures (such as logging, large scale agriculture, or mining). 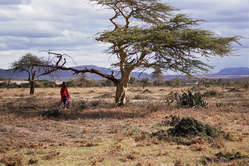 Protected areas are often wrongly described as wildernesses, even though tribal peoples have been dependent on, and managed their lands for millennia. Now, conservation scientists are increasingly recognizing and valuing tribal peoples’ complex systems of protecting and managing their territories. There are global directories of ‘indigenous and community conserved areas’ (ICCAs). ICCAs protect at least as much forest land as official protected areas – perhaps even twice as much. Tribal peoples are better at looking after their environment than anyone else. It is vital that protected areas do not violate the rights of local tribal communities. Any protected area on tribal peoples’ lands should only be established with the free, prior and informed consent of those communities. To best serve the interests of both conservation and tribal peoples’ rights and needs, governments and conservation organisations need to work towards recognising the land rights of local tribal communities and helping them to protect their territories from outside threats.